Crochet star stitch is a beautiful stitch that creates thick texture, warm coziness, and a beautiful design. This stitch can be worked in a few different ways, but as long as you know how to crochet classic star stitch, you will easily be adapted to any other variations that are presented your way through different patterns. Each of the fifteen free crochet patterns in this roundup showcases a different way to use this terrific stitch. Craft them all to practice everything that this stitch can do! This really simple four-row crochet jewelry pattern gives you the ability to practice crochet star stitch without committing to a huge project. If you discover that you love star stitch then you can make many, many of these cuffs to see how it works in different types of yarn. You could also adapt the sizing on this pattern to turn it into a crochet necklace or even a crochet cowl. It is basically a simple row repeat. This would allow you to make a few different items, including matching sets of accessories, while really getting the hang of row after simple row of star stitch. Have fun with it! This crochet designer does an excellent job of taking a stitch, explaining it well through both words and video, and then sharing crochet patterns that make it the star. If you haven't quite mastered the stitch, the videos showing how to do it can help you out. Even if you know the stitch, this is a really great pattern for practicing it. The version shown here is for a skinny scarf, but it explains how to increase your chain by the correct multiples in order to make a wider scarf. If you wanted to, you could even use the same information to make a crochet blanket using the star stitch. It's a simple but versatile crochet pattern. This washcloth pattern uses a unique variation on star stitch. The instructions for the stitch itself are fairly standard. There are always rows between the star stitch rows in a pattern; those are usually hdc or dc stitches, but in this case, the designer has used the unique v-stitch. It's a fabulous choice and it's a fun crochet pattern to work up. The crochet washcloth is worked in two different colors of stripes. You could easily make many variations on it by simply changing the colors. You could use more than just the two colors, making every row a different color, or you could even make a crochet washcloth in a single color so that the stitch is what is showcased without any detraction from color changes. Additionally, since washcloths are small items, they work up quickly, giving you an instant gratification project. This is always nice when you are practicing a new crochet stitch because it gives you the sense that "yes, I can accomplish this cool new thing". Crochet designer Hopeful Honey offers a free video tutorial for the star stitch to make sure that you are able to work it in the way that she understands it. That makes this a great beginner pattern for practicing this multiple-loop stitch. She also includes the written instructions for the stitch and the entire pattern. It's a beautiful infinity scarf worked in pretty worsted weight yarn. 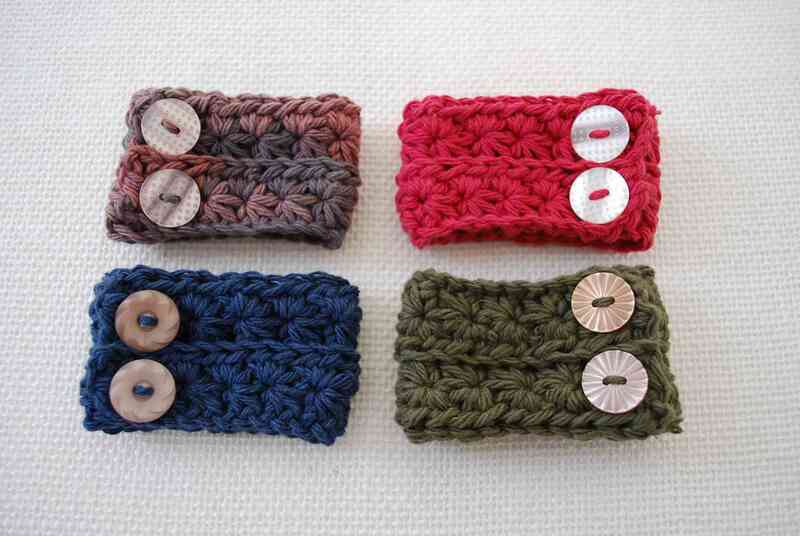 Additionally, the designer links to her crochet headband pattern. It utilizes the same stitch but is a smaller pattern. This gives you the option to practice the smaller item first if you aren't quite sure how you're going to do with star stitch. Alternatively, it provides you with a second item so that you could make both to create a matching set. It's always special to give matching sets as gifts, so if you like to crochet for others then this is a good star stitch set option. This pattern really allows the beauty of the star stitch to shine through, especially in the version made in a single white color. You get a really good sense of the true texture of this stitch. The density of it makes it a great choice for wearables intended to keep you warm, so wristers are a top selection for using crochet star stitch. This free winter crochet hat pattern begins with a beautifully ribbed brim then the star stitches are used to make the cap of the hat. They are worked in the round, giving yet another new way of working with this terrific textured stitch. The combination of the variegated yarn and the dense texture really make this a beauty to craft (and wear!) As you begin to work more and more with the stitch, you'll get a feeling for whether you like it best in solid colors or in multi-colored yarn projects. This crochet hook case not only gives you the opportunity to practice classic star stitch, but it also serves as a really great addition to your set of craft tools. It's customizable so that you can add and remove hooks when your tool collection changes. It rolls up nice and tight so you can easily take all of your hooks on the go. One of the places that you might take your crochet hooks is to craft with others, at conventions or meet-ups, where other knitters and crocheters are going to see your crochet hook case. This is one of those hook cases that you will be proud to show off as having crafted by hand! This is a crochet capelet that includes a hood, which you can wear up or down for different styles. The star stitch is the star of the show but it's also complemented beautifully by the details of the shell stitch at the bottom of the piece. Star stitch is definitely a versatile stitch that works well with a lot of other stitches. The star stitch is a dense, tightly woven stitch. For that reason, it pairs really well with more open or loose stitches. The shell stitch is kind of between closed and open and we see it serves its role well here against the star stitch. This is another great example of a crochet pattern that combines star stitch with another stitch pattern to truly emphasize the beauty of each. The open mesh is perfect for this summer market bag but the star stitch helps the bag hold its shape while sharing the true beauty in the details of crochet. At first glance, this looks like a really basic star stitch crochet pattern, which is excellent because it shows precisely how wonderful the design of the stitch is. However, the designer has also done a great job of explaining gauge when it comes to getting the right fit for a cell phone cozy in star stitch. Gauge matters a little when it comes to your electronics and a lot when it comes to clothes so it's great to get a chance to practice it with the instructions included in this free pattern. This crochet pattern is shown here in Boutique Unforgettable Yarn, a great yarn with n aurally wonderful color changes. It's a great example of how the star stitch can look different depending on the yarn colors you select to work with. The designer has also provided instructions for making a similar crochet star stitch headband using bulky yarn instead of the worsted weight yarn in the picture. The designer here has created a great variation on a classic star stitch. Classic star stitch is worked in a row, followed by a stabilizing row of hdc or dc stitch, followed by another row of star stitch. Here, there are several more rows between each star row. This allows you to really see the unique shape of the isolated star stitches. This crochet pattern uses two different versions of the star stitch―one with four "legs" (also known as spikes) and another with five "legs"―so you get to practice something a little different, gain even more understanding of the stitch and see how it can be changed in small ways. This is a doily crochet pattern but could be worked with different yarn and hook to create a star stitch oval rug. This crochet pattern is truly unique. It uses a variation on the crochet star stitch that relies on only the first row of the stitch pattern. And instead of being worked in rows, it is worked spiral in the round. If you have already practice some basic star stitch, this one is a great new thing to try to add to your repertoire of the stitch.